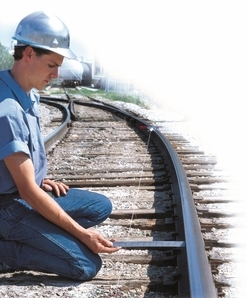 Measure track curvature or visually judge the straightness of straight rail. Steel paddles lock to rail head. The custom 12" ruler measures the space between the rail head and the red-marked midpoint of a 62 ft. cord. Each inch of space between rail and string equal one degree of curvature. Accuracy of measurement is +/-4%.